This week’s Featured Poet Daniel Watkins interviewed. I’m going to make myself really unlikeable straight away by beginning with quoting Ernest Hemingway. He once said “my aim is to write down what I see and what I feel in the best and simplest way” and that just about sums it up for me too. I’ll confess that sometimes when I read contemporary poetry I haven’t got the faintest idea what the poet’s actually talking about, and that’s influenced me to try and make what I write as accessible as possible, so that even people that don’t like poetry might glance at one of my poems and think “actually, that one’s alright”. I co-wrote a story about a silly sausage when I was four, if that counts. Do you have any publications to your name? What’s the next stage for your work? There’s Read This!, and that’s about all so far. The next stage is yet to reveal itself, but if I happen to ever write a line or come up with an image that makes someone think “yes! That is exactly what that’s like”, then that’d be a big box ticked in the creative checklist of my imagination. Through Read This! I had a poem featured in a newspaper in Edinburgh. Other than that, it’s probably the feeling you get when you read something in a workshop and everybody else there agrees about liking a particular bit of it – it’s always nice to hear that you got at least one part as right as it could be. The best thing is that it sorts out my head – whether I’m writing about a situation or a thought or a feeling, once it’s down on the paper (or the screen) then … I don’t know, I just feel like it’s been sorted, and it doesn’t need to confuse, frustrate or concern me anymore. Worst thing is probably when I have a brilliant idea that I just can’t turn into anything half-decent. I know that it should be this amazing, wonderful thing, but what I have in my head just won’t translate itself into real words. Argh. My other tip is something I picked up from Sean O’Brien. It is, essentially, this – when you have written a poem and typed it up and printed it off, no matter whether you think it still needs a bit of work or think it’s all done, do this – leave it for a few weeks, then come back to it and write it out again by hand. Little things that you would never otherwise have noticed come leaping to your attention. Scribble the changes then write it out by hand again. Make any further changes that have become apparent, then write/type it up properly again. You’ll have a much more finished-feeling poem. I was sceptical of this approach myself, to be honest, but I tried it out recently and it bloody well works! I am now using it for every poem. Sometimes it’s just an odd word or comma that’ll be changed, but sometimes that’s all a poem needs. Sometimes huge changes occur, and again it’s what the poem needs. Well, in terms of what, it’s really just the everyday – stuff you might see, think about for a couple of seconds, then move on from. In that couple of seconds, I’ll probably scribble down a little note before I forget, and then later on I look back at it and see if it can become a poem. I explain it a bit better in my bio. For who, the best (well-known) poet who comes to mind is Matthew Sweeney, but if I’m honest, prose writers actually influence me more – mostly for their use of language. I find Cormac McCarthy’s style of writing incredibly powerful and poetic (if you haven’t read The Road, please, please, read it), and I also find myself influence by the likes of CS Lewis and Terry Pratchett, who both seem to have the knack of explaining something through metaphor using very straightforward, everyday language, but getting the essence of that thing absolutely, perfectly, that’s-exactly-how-that-is spot-on. Which brings us all the way back to the Hemingway quote. If I can try my best to live up to that aim, I’ll hopefully be on the right track. Want to see your poems featured here? Drop me a line to claire@onenightstanzas.com! Don’t forget The One Night Stanzas Store, my Etsy store, and their little sister, Edinburgh Vintage! Daniel’s poem from yesterday was Stalemate — interview and the final poem tomorrow. In the meantime, enjoy! 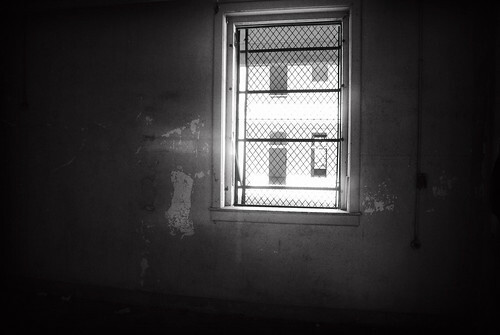 A room in the dark. Like the finger that finds the best track on the album, the eyes that locate the best passage of the book without the mind’s assistance, a room in the dark is work for the arms that commit it to memory in light. Outstretched like the living dead (as comfortable in the black), the hands of a pianist move past chairs and electronics to the pointing digit of the door. Push. Pull. Out of the dark. Daniel Watkins has just finished an MA in Creative Writing at Newcastle. He likes writing, but is sometimes unsure about whether writing likes him. He tends to write poems concerning trivial and ordinary things because quite often they turn out to be the most interesting. 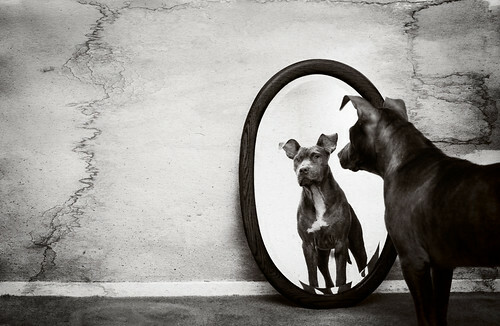 A dog sees himself in glass. He has never seen himself before. He does not recognise himself. The other dog does likewise. returned with still equal veracity. He stares defiance at the other dog. The other dog stares too. You are currently browsing the One Night Stanzas blog archives for August, 2009.